For over a century The Carlyle Johnson Machine Company has manufactured quality mechanical clutch and power transmission products. We offer a variety of standard mechanical clutches, all of which can be modified to meet your needs and requirements. Our mechanical clutch models are available with torque ranges from 10-2400 lb. ft. (torque depends on clutch model), though mechanical clutch units with customized torque are also available. We also offer a range of mechanical clutch HP capacities, and our exclusive "floating disc packs" that reduce drag, abrasion and heat built-up in neutral, while also providing consistent release. Many of our mechanical clutches are available in single or double designs, and can be customized to meet your exact specifications. 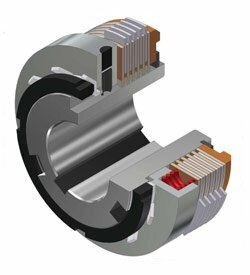 Our experienced engineers are ready to design and manufacture the custom mechanical clutch you need, or build a complete power transmission system. For more information on designing your industrial mechanical clutch please visit our clutch and brake guidelines. As one of North America's leading mechanical clutch manufacturers, Carlyle Johnson parts are recognized for quality and proven performance. If you don't see the mechanical clutch you need here please contact us – many of our clutch models do not appear in our standard catalog, and all of our products can be customized. Carlyle Johnson works to ensure our mechanical clutches provide a long operational life and deliver the best return. We repair and perform maintenance on all of our mechanical clutch models, quickly returning serviced industrial brakes and clutches to you. We also routinely upgrade, retrofit and overhaul mechanical clutches, extending life spans or repairing clutch units that are no longer available for replacement.